Rajeev Kumar, who recently was at the centre of a faceoff between the West Bengal police and the Central Bureau of Investigation (CBI), which is probing the Rs 2,500 crore Saradha chit fund scam, was transferred from his previous post as the commissioner of police, Kolkata in the rank of an additional director general (ADG) to the state’s Criminal Investigation Department (CID) as ADG and inspector general of police (IGP). Anuj Sharma, a 1999-batch IPS officer, who has been credited for playing a crucial role in controlling law and order during last year’s Gorkhaland separatist movement, was promoted from his previous post of ADG and IGP of law and order in West Bengal police to replace Kumar. The shuffling follows directions from the Election Commission in wake of the forthcoming general elections. A notification announcing the new appointments mentioned the cause of these transfers to have been “made in the interest of public service”. Earlier this month, the CBI had sent a team to question Kumar at his residence in course of the agency’s investigations on the chit fund scam. However, the Kolkata police rounded up the CBI team and detained them in a local police station with Kumar being inaccessible to the CBI that day. The Centre had alleged that the CBI had sent repeated notices to Kumar to appear before the CBI for questioning, but Kumar had avoided it. Sources suggested that had Kumar’s statements were found to be unsatisfactory to the CBI, he could have faced arrest. Following this drama, which led West Bengal’s chief minister Mamata Banerjee to stage a dharna, alleging the centre of using pressure tactics to frighten her party in wake of elections, the matter went to the Supreme Court. In its order, the country’s apex court ruled that Kumar cannot be arrested by the CBI but this top cop has to co-operate with the CBI in course of its probe. 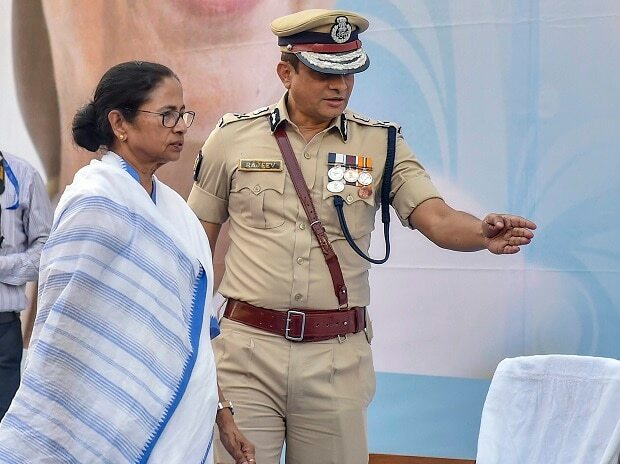 Kumar, a 1989-batch IPS officer, had earlier been appointed as the commissioner of police in the Bidhannagar Police Commissionerate and as Special Task Force chief under the Kolkata Police. He was also a member of the Special Investigation Team formed by the Banerjee government to investigate the Saradha and Rose Valley chit fund scams which came to light in 2013. Later, Kumar took over charge as the Kolkata police commissioner from Surajit Kar Purakayastha.